Nora Jane Struthers & The Party Line bring their traveling Carnival of acoustic Americana to Beaver Creek on Sunday, Nov. 3 when they perform at Vilar Performing Arts Center (www.vilarpac.org). The high energy, Nashville-based quintet perform Struthers’ original story-songs with tight, three-part harmonies, fiddle, claw-hammer banjo, acoustic guitar, bass, and drums. 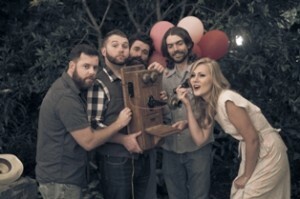 Nora Jane Struthers & The Party Line play the Vilar Center Nov. 3. Struthers was catapulted into the spotlight when she lead her band to a blue ribbon at the prestigious 2010 Telluride Bluegrass Festival band competition (previous winners include Nickel Creek and The Dixie Chicks) and now her group is touring heavily in support of their 2013 release, Carnival. Nora Jane Struthers steps forward with a distinctive sound and on-stage style – her personal collection of vintage dresses makes her one of the most visually striking of modern acoustic artists. But the moving, perceptive, and witty songs on Carnival represent a new quantum leap, born of hard work and deep creative reflection. After listening to Carnival, no one will deny the keen edge of Struthers’ masterful new work. The Party Line (which takes its handle from one of the record’s songs, about the early days of rural telephone calls), includes gifted instrumentalists Joe Overton (clawhammer banjo and harmony vocals), Jack Devereaux (fiddle), Nick DiSebastian (upright bass and guitar) and Drew Lawhorn (drums).